On July 10, TUT came to an agreement regarding a proof-of-concept utilizing AI for developing automatic translation on a government website. 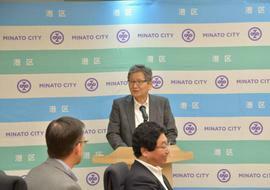 A ceremony was held to conclude the agreement to increase the English translation accuracy of the frequently-used official website of Minato City, made between the Minato City, Microsoft Japan Co., Ltd., and Global Design Co., Ltd., through TUT's industry, government and industry-academia collaboration. 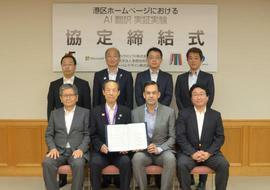 With this, we aim to develop and put into practical use Japan's first "AI governmental translation system." For more details, please visit the link below. © Toyohashi University of Technology, All rights reserved.